Yesterday saw weaker-than-expected protests: Some 800 protesters took to the streets in Charlotte to slam big banks, lax environmental policies, and more. Two were arrested. 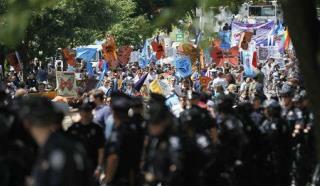 Police had predicted a far bigger protest of between 2,000 and 10,000, the Charlotte Observer notes. The Romney camp is looking to grab some headlines: Paul Ryan will campaign a few hundred miles away today, asking voters, "Are you better off than you were four years ago?" Some 50 GOP staffers are already camped outside the DNC, and plan speeches of their own from luminaries like Nikki Haley, the AP reports. Show Dems the money: Leading Democrats are hoping for a cash windfall from the convention, with super PACs offering tickets to party with Jessica Alba and musician Pitbull to donors of $100,000. They'll also get tickets to a gathering with top Democratic officials, with food from chef Alice Waters, Politico reports. Tomorrow's bigwig No. 1: Michelle Obama: She's got a tough task—convincing voters to support the president's economic plans—but insiders think she's up to the job. The campaign considers her "the closer" whose warmth and family stories can generate as much enthusiasm as the president himself, the Hill reports. And No. 2: San Antonio Mayor Julian Castro will deliver the keynote address. It does not matter who you like,this is not about a beer buddy,it is about turning this country around for the better ...and that is something Obama had a chance to do and failed badly!! It's not like I don't like Willard the rat Romney and little lyin Ryan. It is just, You can not believe a word they are saying. The native American indians had a phrase for this, white man speaks with forke tongue. Wake up America vote independent, give America a chance.